Yes, I'm going to sound like every person ever, but boy did September fly by! It's already 6 days into October and I'm only now finding time to sit down and look at my goals. I did alright in September. By alright I mean I completed about half my goals, which, for me is actually pretty good. First was training for S2S (recapped in my last post here). I wasn't as in shape as I would have liked to be, but I completed all my legs with my average speed at 15mph so I'll consider that goal completed. I also finished one book in the month of September. Sadly, I didn't love it, but it was okay and I did finish it so another goal done. I didn't get to spend as much quality time with the hubs but we were extremely busy and with him starting his new career we're still trying to find a routine that works. That's definitely a goal I want to make (maybe just to myself) every month. I didn't come close to trying one new recipe a week...in fact we were lucky if we even got a meal at home. September was a busy month for us so unfortunately our diets suffered. I did start a gratitude journal and while I'm not as consistent filling it out as I'd like to be yet, it does feel good to start and end my day on a happy note. 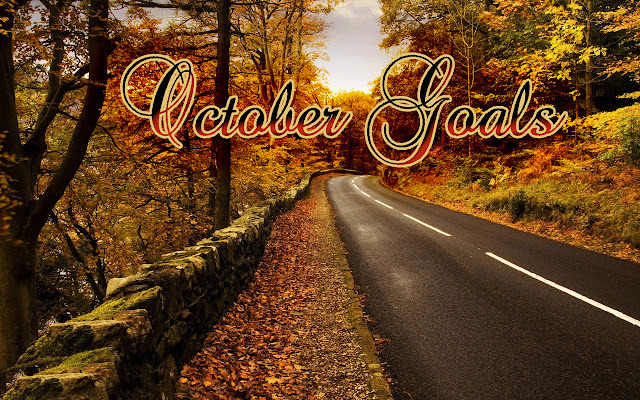 October is another month and a fresh start, so here are my October goals! 1. Let's be realistic, the holidays get super busy. Instead of trying a new recipe a week, I'm going to try to make at least one for this month. I know that seems too easy, but believe me, it will be quite challenging. I am so eager to get back into the kitchen though, I think it'd be good to start with one. 2. My second goal is to complete at least half my Christmas shopping. I say this one every year, and every year I fail. If I know I have to come back and answer to my blog, I'll be more likely to complete this. 3. With the colder weather rolling in, I tend to want to stay inside a lot more often. So this month I'd like to try getting through two books. I already have one in mind I'd like to start, let's just hope I like it better than last months pick. I think for this month those are the only goals I'm going to focus on. I have a lot on my plate (as we all do) with the holiday times rolling in and I think this will keep me busy and focused this month! If you do monthly goals leave me a link below, I always love to see what people are trying to accomplish and hopefully we can encourage each other. Happy October! You are a smart woman!!! You know your time constraints and 3 sounds like the perfect amount. It's so great to have goals but sad when people make so many then beat themselves up if they don't make them all. I just want to make it through this month breathing and yes, at least one book and I'm shooting for 1/4 of my Christmas shopping done. Plus, hubs and I would love a weekend nature get away up north!! Have a fantastic day beautiful!! September really did fly by! I think getting half of your goals completed is a pretty amazing start. In fact, I know that's better than I would have done! It's so tough with work to get the things you want done, but these goals are such a great way to set priorities. I would love to see what you end up making for your new recipe of the month!